Departure Location: 305 Lincoln Road (Main Station) Miami Beach FL 33139 or Hotel Pick-up. Tour Includes: The Miami Double Decker City Tour by Bus. The open top doube decker bus tour will explore all of Miami Beach, Downtown, Financial District, Coconut Grove, Coral Gables, & Little Havana. This tour includes free time at Bayside Market Place for lunch or shopping. Approximate return time may vary from 30 minutes to an hour. You will hop-on & hop off at different locations. Yes, we do offer hotel pick so if you purchase it online, after booking it please give us a call to 305-865-9999 so we can schedule a hotel pick up. If your staying at south beach, you are more than welcomed to come to the store for the departure. You'll be the 1st to aboard. Yes, we pick up at hotels. Things to see: Miami Beach, Downtown, Financial District, Coconut Grove, Coral Gables, Little Havana, Star Island, Palm Island, Monument Island, Hibiscus Island, Miami Skyline. If you purchase the morning tour you will have free time for lunch time and shopping time at Bayside Marlet Place. Miami Double Decker reserves the right to change, modify, or cancel certain routes without notice due to traffic, events, concerts, safety, etc. 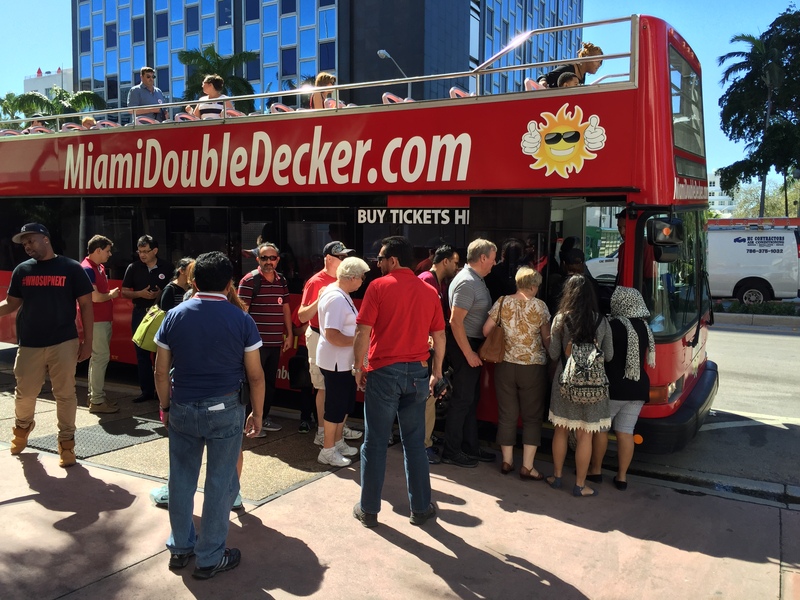 Miami Double Decker offers an awesome Double Decker City Tour! Take a ride a-top a Double Decker Bus with great views everywhere your tour takes you! Visit many of the local hot spots in Miami Beach, Downtown Miami, Coral Gables, and Coconut Grove. See Famous Sights around Miami Beach, the Art Deco Architecture, the Colorful building and Beautiful Island of Miami Beach. Cruise across the causeway to Downtown where you will have time to visit, world famous, Bayside Market Place. The Tour continues to some amazing historic sites in Coral gables and Coconut Grove with free time to hop off at Cocowalk! This tour is a great way to get to see all the different hot spots in and around Miami Beach. Book online for the best prices on Double Decker Tours in Miami. Leave aside your mundane life for a few days and enjoy the best of Miami with our bus tours. Board our bus and relax, while we take you to famous landmarks in Miami. The joy of traveling in an open-top bus is something that you cannot express in words. Our Miami bus tours cover various sights including the colorful communities of Little Havana, the entertainment hub of South Beach, Coconut Grove, among the others. With our hop-on and hop-off bus tours you can explore the Magic City at your own pace, i.e. get down at the point of interest that you admire the most, captivate some precious moments and then jump back on the bus to complete your tour. Take our beach tour and spend some quality time in the sandy beaches. The tour departs from Central Station and leaves you at the Miami Beach Island. En route, you can marvel at various attractions including the Collins Avenue, Washington Avenue, and Ocean Drive. Enjoy yourself and for once ignore the soaring national debt, the recession that does not quit, regulations that are killing your business, and so on. Board our city tour bus from the Central Station. On this tour, we take you to some of the most striking districts of mainland Miami like Little Havana, Coral Gables, Downtown Miami and Coconut Grove. Besides, you will also tour other attractions like Venetian Pool, Millionaires' Row, Freedom Tower, the County Courthouse, the Biltmore Hotel, and Vizcaya Museum. On this tour, we take you to the unique and diverse areas of Upper Miami where you can explore the Overtown, Midtown, and Historic Downtown Miami. Hop-off and tour the different art galleries, shopping centers, and museums that these distinct areas are home to. Why choose our bus tours? The hop-on, hop-off is perhaps the best thing that makes us famous. With such a benefit, you have the freedom to explore the Miami attractions at your own pace. You also have the liberty to plan your own itinerary, get down at the desired places, and spend some time before jumping back into the bus. While you sit back and relax enjoying the beautiful Miami sights, our expert guides narrate you the fascinating facts about the different points of interest. The informative and interesting commentary educates you about the glorious past about the Magic City and its historical landmarks. Whether this is your first trip to Miami or you’ve lived here for quite long, you’ll be amazed touring the awesome sites on our open-top buses. Book your tickets, board our bus, and take the first step to explore the beauty of the Magic City.